The View co-host Elisabeth Hasselbeck brings gluten-free living into the spotlight as the next big movement in health and wellness. Are you looking for information and support on living the Gluten Free lifestyle? Elsabeth Hasselbeck's book GFree Diet was instrumental in the beginning of my gluten free journey. The ups and downs to stay compliant to this lifestyle diet have been tough and also well worth the effort. I’ve been through denial, pain, fatigue, isolation, confusion and panic when going out to restaurants, traveling, being around people in groups when choosing the place to eat and being in a panic when they choose an Italian place. If you've been through any of these situations you are not alone!! Experiencing the frustration of walking into the grocery or health food store was mind boggling at first when not knowing what on earth to eat and what's going to trigger more pain again. Learning to read every label has been very helpful. Learning too that gluten is in so many products as well as non food products has been real eye opening. Were you aware that Gluten is in makeup, shampoo, lip gloss, hair color and some of our health supplements so it’s been really important to keep a close eye on labels? Because back in 2008 I was not aware of this until I read Elisabeth's book. Have you ever experienced driving around for hours when out looking for something to eat and had to settle for potato chips and water? Been there done that too. Do people look at you like you're crazy or weird when you say you are gluten free or that you cannot eat wheat and even grains in my case? I was elated when first hearing about Elisabeth’s book. It's full of great resources, recipes, grocery stores, foundations, online forums, and is a literal survival guide for those who find out they cannot have gluten and decide on living a Gluten Free lifestyle. "It turns out I have a lot of company! Apparently, I am not alone in benefiting from the G-free diet: According to the University of Chicago, 1 out of every 133 otherwise healthy adults in the United States has celiac disease that's nearly 3 million of us. But a gluten-free lifestyle can help countless others as well. People suffering from a wide range of diseases from autism to osteoporosis, from diabetes to rheumatoid arthritis can often benefit from this change in diet. Even people with no health issues have a great deal to gain by giving up gluten. The G-free diet can help with weight management. It can elevate your energy levels, improve your attention span, and speed up your digestion. Whatever your motivation for going G-free whether you have celiac disease or a gluten intolerance, or a basic desire to live a healthier, longer life this book will help you achieve your goal. It's an all-inclusive, easy-to-read survival guide to living without gluten and loving it. I will define gluten in all its particulars, and teach you how to spot it in the unlikeliest places. I will also help you navigate social situations, and instruct you in the art of reading both food and beauty product labels. “Delightfully Free" is full of these food ideas—all GF, DF and free of refined sugar. It’s really a complete look at all Tracy’s best recipes from all categories: breads and muffins, soups and salads, chicken, fish, eggs, fruit, veggies, snacks, cookies, cakes, pies, crumblies. 5. Purpose Now – do you wake up with a purpose in your life? *Fitness to Function, LLC - Private Personal Training Studio - www.fitnesstofunction.com (Give Diane a call or drop in to their studio by the Spicewood store and tell her the Gluten Free Lady sent you! My husband's been doing CG for since about November 2016. He loves it! (He turns 67 March 2018). 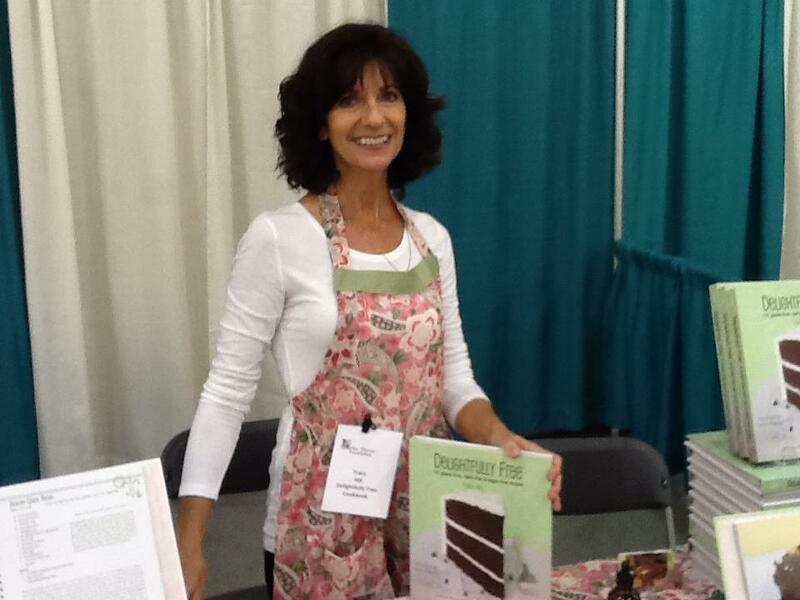 Tell Laurie Byington that the Gluten Free Lady sent you! Click Here For Gluten Free Restaurants In Austin Texas! Be sure to download the FIND ME GLUTEN FREE APP so you can find places to eat when out and about and traveling! Totally Gluten/Wheat Free kitchen! Salad and hot bar with home cooking, usually three meats, fish, tacos, sandwiches and great desserts! They also sell breads. We ate at Fogo de Chao for my husband's company Christmas party in 2017 and I had no issues. They make these really delicious rolls too all gluten free made with Casava flour! Very yummy with lot's of butter! Tremendously awesome salad bar too! I ate mostly the filet and had some ribs. The chicken legs are marinated in beer so that's a no no for Celiacs and gluten sensitive folks. All Star Burger at the Bee Cave Galleria. Dedicated fryer for fries. Burger is awesome with gluten free bun or try one skinny with lettuce. They also have gluten free cookies, brownies and shakes. I eat here often and have not gotten sick. Daily Juice in the shops of the Galleria. We believe in whole ingredient foods. No added sugars, chemicals or processed factory foods. Most people today have diets that are poor in nutrient density and quality, resulting in chroic conditions that are mostly preventable when you use food as medicine. Our fresh juices, smoothies and salads contain the vitality that will energize and nourish you. Visit us andsample amazing juices that are delicious! Eat better, Feel Better. When we go out of town to visit our son on the east coast we eat at PF Changs, One Dish Cuisine Deli and Bakery in Ellicott City. Totally dedicated gluten free cafe, they have a dairy free menu too. The burgers and fries are awesome and so is their pizza! We also eat at Glory Days when we're on the east coast! Great burgers and dedicated fryer for fries! Click Here To Find some of your favorite restaurant recipes!